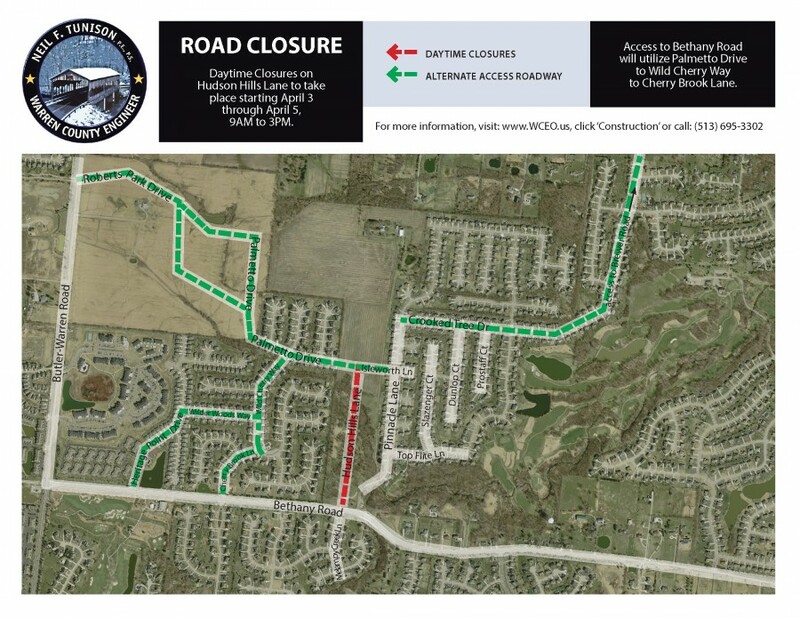 Lebanon, Ohio – Deerfield Township – Starting Tuesday, April 3, 2018, Hudson Hills Lane will be closed from 9:00 a.m. – 3:00 p.m., for three (3) days, weather permitting. The closure of Hudson Hills Lane is for the removal of four concrete islands to improve the safety of the traveling public, allow on-street parking on the east side of the street and provide more space for construction. Lebanon, Ohio – Deerfield Township – The Warren County Engineer’s Office will be closing Fields Drive at Mason-Montgomery Road permanently, effective Monday, April 9, 2018. Access to Mason-Montgomery Road and Fields Drive will be from Old Irwin-Simpson Road. 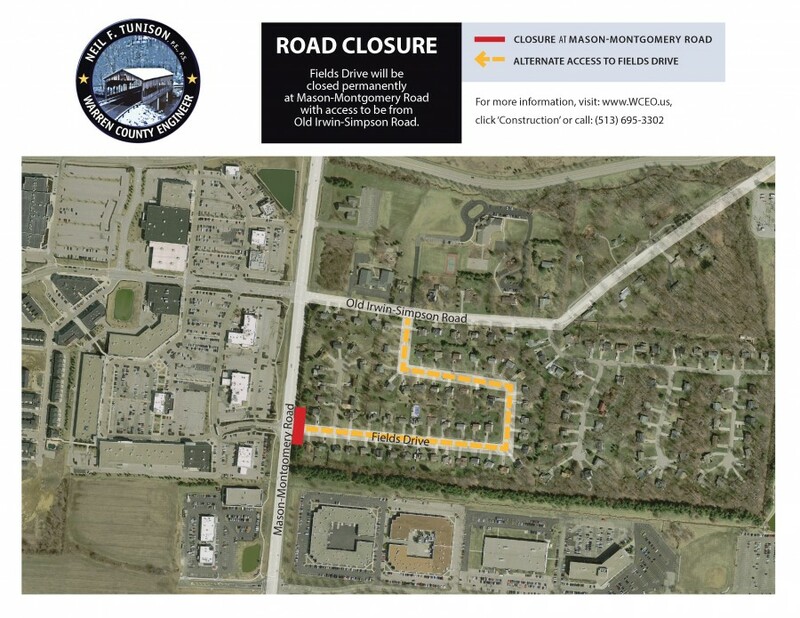 Lebanon, Ohio – Deerfield Township – Duke Boulevard will remain closed an additional one (1) day, 0.34-miles north of Irwin-Simpson Road, with work being completed Tuesday, November 14th, by 3:00 p.m., weather permitting. Lebanon, Ohio – Deerfield Township – The Warren County Engineer’s Office will be closing Pinnacle Lane at Bethany Road permanently, effective Monday, November 20, 2017. Access to Bethany Road and Pinnacle Lane will be from the newly constructed Hudson Hills Lane and Isleworth Lane. Alternative access roadways available for use are Cherry Brook Lane, Heritage Point Drive, and Roberts Park Drive. 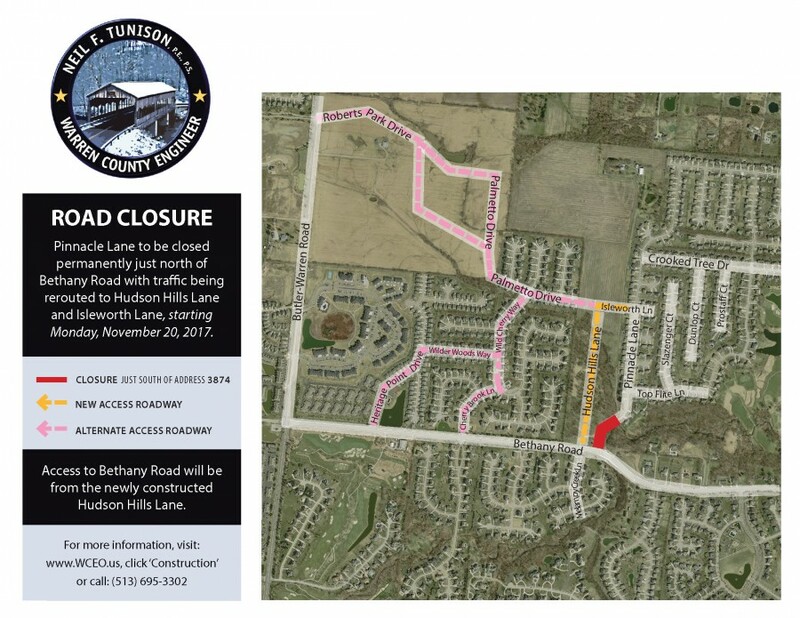 Lebanon, Ohio – Deerfield Township – Duke Boulevard will remain closed an additional seven (7) days, 0.34-miles north of Irwin-Simpson Road, with work being completed Monday, November 13th, weather permitting. An incorrect date was provided in a previous press release. Traffic maintenance for the closure will remain the same through the extension. Motorists traveling to the front entrance of the strip commercial/industrial center located at 8461 Duke Boulevard will access from the south (Irwin-Simpson Road). Access to the rear truck entrance for the same 8461 Duke Boulevard strip commercial/industrial center will be from the north (Socialville-Fosters Road). Access to Intralot, Inc., 8450 Duke Boulevard, will be from the north on Duke Boulevard via Socialville-Fosters Road through the newly constructed roundabout.